by Chris Woodford. Last updated: September 29, 2018. Digital cameras give a whole new meaning to the idea of painting by numbers. Unlike old-style film cameras, they capture and record images of the world around us using digital technology. In other words, they store photographs not as patterns of darkness and light but as long strings of numbers. This has many advantages: it gives us instant photographs, allows us to edit our pictures, and makes it easier for us to share photographs using cell phones (mobile phones), e-mail, and web sites. Photo: A typical low-cost digital camera. The circle is the lens; the rectangle above it is a xenon flash lamp. You can see what this camera looks like inside in the photo lower down this page. Photo: An old-style film camera from the late 1980s. The film loads in a spool on the right and winds across to another spool on the left, passing in front of the lens on the way. When you take a photo, the shutter lets light enter from the lens and expose the film. It's all very 19th-century compared to digital photography! If you have an old-style camera, you'll know that it's useless without one vital piece of equipment: a film. A film is a long spool of flexible plastic coated with special chemicals (based on compounds of silver) that are sensitive to light. To stop light spoiling the film, it is wrapped up inside a tough, light-proof plastic cylinder—the thing you put in your camera. This isn't quite the end of the process, however. When the film is full, you have to take it to a drugstore (chemist's) to have it developed. Usually, this involves placing the film into a huge automated developing machine. The machine opens up the film container, pulls out the film, and dips it in various other chemicals to make your photos appear. This process turns the film into a series of "negative" pictures—ghostly reverse versions of what you actually saw. In a negative, the black areas look light and vice-versa and all the colors look weird too because the negative stores them as their opposites. Once the machine has made the negatives, it uses them to make prints (finished versions) of your photos. If you want to take only one or two photographs, all of this can be a bit of a nuisance. Most people have found themselves wasting photographs simply to "finish off the film." Often, you have to wait several days for your film to be developed and your prints (the finished photographs) returned to you. It's no wonder that digital photography has become very popular—because it solves all these problems at a stroke. 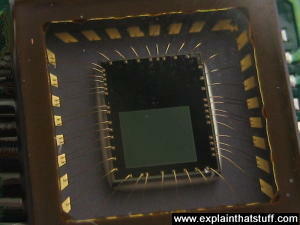 Photo: A typical image sensor. The green rectangle in the center (about the size of a fingernail) is the light-sensitive part; the gold wires coming off it connect it into the camera circuit. Digital cameras look very much like ordinary film cameras but they work in a completely different way. When you press the button to take a photograph with a digital camera, an aperture opens at the front of the camera and light streams in through the lens. So far, it's just the same as a film camera. From this point on, however, everything is different. There is no film in a digital camera. Instead, there is a piece of electronic equipment that captures the incoming light rays and turns them into electrical signals. This light detector is one of two types, either a charge-coupled device (CCD) or a CMOS image sensor. If you've ever looked at a television screen close up, you will have noticed that the picture is made up of millions of tiny colored dots or squares called pixels. Laptop LCD computer screens also make up their images using pixels, although they are often much too small to see. In a television or computer screen, electronic equipment switches all these colored pixels on and off very quickly. Light from the screen travels out to your eyes and your brain is fooled into see a large, moving picture. In a digital camera, exactly the opposite happens. Light from the thing you are photographing zooms into the camera lens. This incoming "picture" hits the image sensor chip, which breaks it up into millions of pixels. The sensor measures the color and brightness of each pixel and stores it as a number. Your digital photograph is effectively an enormously long string of numbers describing the exact details of each pixel it contains. You can read more about how an image sensor produces a digital picture in our article on webcams. Once a picture is stored in numeric form, you can do all kinds of things with it. Plug your digital camera into your computer, and you can download the images you've taken and load them into programs like PhotoShop to edit them or jazz them up. Or you can upload them onto websites, email them to friends, and so on. This is possible because your photographs are stored in digital format and all kinds of other digital gadgets—everything from MP3-playing iPods to cellphones and computers to photo printers—use digital technology too. Digital is a kind of language that all electronic gadgets "speak" today. Photo: Digital cameras are much more convenient than film cameras. You can instantly see how the picture will look from the LCD screen on the back. If your picture doesn't turn out okay, you can simply delete it and try again. You can't do that with a film camera. Digital cameras mean photographers can be more creative and experimental. If you open up a digital photograph in a paint (image editing) program, you can change it in all kinds of ways. A program like this works by adjusting the numbers that represent each pixel of the image. So, if you click on a control that makes the image 20 percent brighter, the program goes through all the numbers for each pixel in turn and increases them by 20 percent. If you mirror an image (flip it horizontally), the program reverses the sequence of the numbers it stores so they run in the opposite direction. What you see on the screen is the image changing as you edit or manipulate it. But what you don't see is the paint program changing all the numbers in the background. Some of these image-editing techniques are built into more sophisticated digital cameras. You might have a camera that has an optical zoom and a digital zoom. An optical zoom means that the lens moves in and out to make the incoming image bigger or smaller when it hits the CCD. 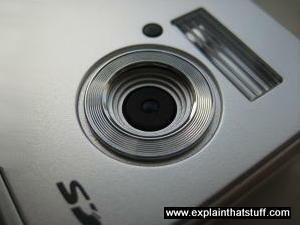 A digital zoom means that the microchip inside the camera blows up the incoming image without actually moving the lens. So, just like moving closer to a TV set, the image degrades in quality. In short, optical zooms make images bigger and just as clear, but digital zooms make images bigger and more blurred. Imagine for a moment that you're a CCD or CMOS image sensing chip. Look out of a window and try to figure out how you would store details of the view you can see. First, you'd have to divide the image into a grid of squares. So you'd need to draw an imaginary grid on top of the window. Next, you'd have to measure the color and brightness of each pixel in the grid. Finally, you'd have to write all these measurements down as numbers. If you measured the color and brightness for six million pixels and wrote both down both things as numbers, you'd end up with a string of millions of numbers—just to store one photograph! This is why high-quality digital images often make enormous files on your computer. Each one can be several megabytes (millions of characters) in size. To get around this, digital cameras, computers, and other digital gadgets use a technique called compression. Compression is a mathematical trick that involves squeezing digital photos so they can be stored with fewer numbers and less memory. One popular form of compression is called JPG (pronounced J-PEG, which stands for Joint Photographic Experts Group, after the scientists and mathematicians who thought up the idea). JPG is known as a "lossy" compression because, when photographs are squeezed this way, some information is lost and can never be restored. High-resolution JPGs use lots of memory space and look very clear; low resolution JPGs use much less space and look more blurred. You can find out more about compression in our article on MP3 players. Most digital cameras have settings that let you take pictures at higher or lower resolutions. If you select high-resolution, the camera can store fewer images on its memory card—but they are much better quality. Opt for low-resolution and you will get more images, but the quality won't be as good. Low-resolution images are stored with greater compression. 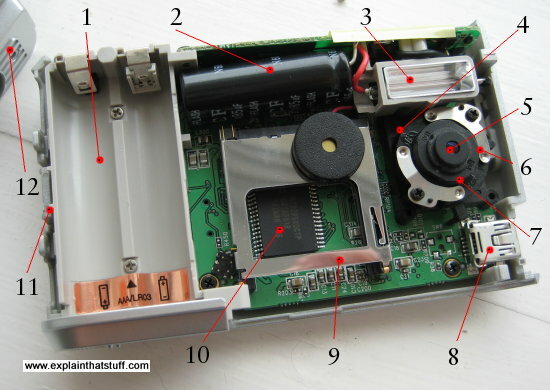 Ever wondered what's inside a digital camera? What takes the photo? Where's it stored? What makes the flash work? And how do all these bits connect together? When you take electronic gadgets apart, they're much harder to understand than ordinary machines (things that work through a clear physical mechanism): you can't always see which part does which job or how. Even so, it can be quite illuminating to peer into your favorite gadgets to see what's hiding inside. I don't recommend you try this at home: opening things up is the quickest way to invalidate your warranty; it's also a good way to ensure they'll never work again! 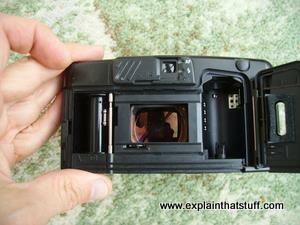 Photo: The parts in a basic digital camera. Were it not for the LCD screen and batteries (the two biggest components), you could probably make a camera like this as small as a postage stamp! Battery compartment: This camera takes two 1.5-volt batteries, so it runs on a total voltage of 3 volts (3 V). Flash capacitor: The capacitor charges up for several seconds to store enough energy to fire the flash. Flash lamp: Operated by the capacitor. It takes a fair bit of energy to fire a xenon flash like this, which is why a lot of indoor flash photography quickly uses up your batteries. LED: A small red LED (light-emitting diode) indicates when the self-timer is operating, so you can take photos of yourself more easily. Lens: The lens catches light from the object you're photographing and focuses it on the CCD. Focusing mechanism: This camera has a simple switch-operated focus that toggles the lens between two positions for taking either close-ups or distant shots. Image sensor: This is the light-detecting microchip in a digital camera and it uses either CCD or CMOS technology. You can't actually see the chip in this photo, because it's directly underneath the lens. But you can see what it looks like in our article on webcams. USB connector: Attach a USB cable here and connect it to your computer to download the photos you've taken. To your computer, your camera looks like just another memory device (like a hard drive). SD (secure digital) card slot: You can slide a flash memory card in here for storing more photos. The camera has a very small internal memory that will store photos too. Processor chip: The camera's main digital "brain". This controls all the camera's functions. It's an example of an integrated circuit. Wrist connector: The strap that keeps the camera securely tied to your wrist attaches here. Top case: Simply screws on top of the bottom case shown here. Another important part, not shown here, is the LCD display that shows you the photos you've taken. It's mounted on the back of the electronic circuit board so you can't see it in this photo. How do digital cameras compare with smartphone cameras? From what I've said so far, you can see that digital cameras are great things—if you're comparing them to old-style film cameras, that is. Thanks to their superb, cutting-edge image sensors, there's really no good reason (other than a nostalgic preference for analog technology) to use film. You might be forgiven for thinking sales of digital cameras would be rocketing as a result, but you'd be wrong. Over the last few years, digital cameras have seen double-digit falls in sales in parallel with the massive rise of smartphones and tablets (which now sell more than a 1.5 billion each year). Check out a photo-sharing site like Flickr and you'll find the most popular "cameras" are actually phones: in June 2018, at the time I'm writing this, Flickr's top five cameras are all iPhones. Is there a good reason to own a standalone digital camera anymore or can you now do everything with a camera phone? Photo: The pros and cons of digital cameras and smartphones summarized in three photos. Even point-and-shoot digital cameras like my old Canon Ixus have bigger, better, telescopic lenses (top) and sensors compared to the ones in the best smartphone cameras, like my new LG (middle). But smartphones undoubtedly score on connectivity and they have bigger, better, and clearer screens (bottom). 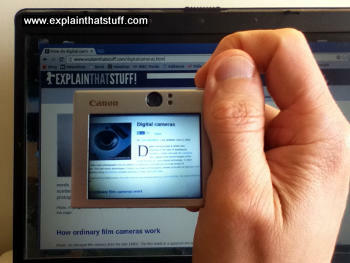 Here you can see my smartphone's huge screen pictured in a preview photo on the Canon's tiny screen. Step back a decade and there was no comparison at all between the rough and clunky snapshot cameras on cellphones and even the most mediocre compact digital cameras. While the digitals were boasting ever-increasing numbers of megapixels, cellphones took crude snaps little better than the ones you could get from a basic webcam (1 megapixel or less was common). Now all that's changed. The 10-year-old Canon Ixus/Powershot digital camera I use routinely is rated at 7.1 megapixels, which is perfectly fine for almost anything I ever want to do. 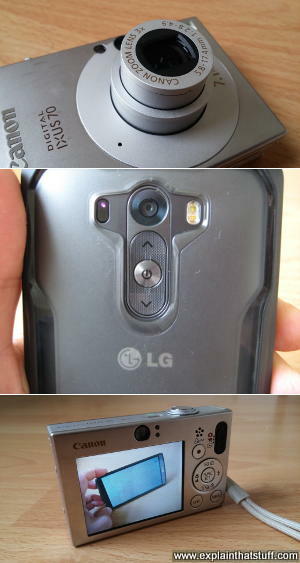 My new LG smartphone comes in at 13 megapixels, which (theoretically, at least) sounds like it must be twice as good. But wait! "Megapixels" are a misleading marketing ploy: what really matters is the size and quality of the image sensors themselves. Generally, the bigger the sensor, the better the pictures. Comparing the raw technical data, the Canon Ixus claims a 1/2.5" CCD while the LG has a 1/3.06" CMOS (a newer, somewhat different type of sensor chip). What do those numbers actually mean? Sensor measurements are based on needlessly confusing math that I'm not going to explain here, and you'll have take it on trust that both of these cameras have tiny sensors, about half the size of a pinkie nail (measuring less than 5mm in each direction), though the Canon sensor is significantly bigger. The Digital Ixus, though eight years older than the LG smartphone, and with apparently half as many "megapixels," has a significantly bigger sensor chip and one that's likely to outperform the LG, especially in lower light conditions. The Canon also scores with a much better, telescopic lens (technically rated 5.8–17.4 mm, which is equivalent to 35–105mm)—better quality and telescopic to boot—that can take everything from infinity-distance landscapes to close-up macro shots of spiders and flies. But I have to upload my photos to a computer to get a sense of how good or bad they are because the Canon only has a tiny 6cm (2.5-inch) LCD screen. The LG is over twice as good on the diagonal screen dimension, with a 14cm (5.5 inch) "monitor." Where Canon estimates that the Ixus screen has 230,000 pixels, the LG boasts quad HD (2560×1440 pixels), or roughly sixteen times more. I might not be able to take better photos with the LG, but at least I can instantly assess and appreciate them on a screen as good as an HD TV (albeit still pocket-sized). Bear in mind that my Canon is just a point-and-shoot compact, so this is not really a fair comparison between what you can achieve with a really good digital camera and a really good smartphone. My LG is right up at the better end of smartphone cameras, but the Ixus isn't anywhere near as good as the best digital cameras. A professional DSLR would have a much bigger sensor than a smartphone—up to 3.6cm × 2.4cm—so it would be able to capture really fine detail in even the lowest of light levels. It would also have a bigger and better screen and better (interchangeable) lenses. Of course, where smartphone cameras really score is in the "smartphone" department: they're computers, in essence, that are pop-in-the-pocket portable and always online. So not only are you more likely to capture chance photos (because you're always carrying a camera), but you can instantly upload your snaps to the aptly-named Instagram, Facebook, or Twitter. And that's the real reason why smartphone cameras have surpassed old-school digitals: photography itself has changed from the digital-equivalent of the 19th-century Daguerreotype (itself a throwback to the portrait paintings of old) to something more off-the-cuff, immediate, and, of course, social. For the purposes of Facebook or Twitter, often viewed on small-screen mobile devices, you don't need more than a couple of megapixels, at most. (Prove it yourself by downloading a hi-res image from Instagram or Flickr, and you'll find it's seldom more than a couple of hundred kilobytes in size and 1000 megapixels or less in each dimension, making less than one megapixel in total.) Even on better photo-sharing websites like Instagram and Flickr, most people will never be browsing your photos in multi-megapixel dimensions: they simply wouldn't fit on the screen. So even if your smartphone doesn't have masses of megapixels, it doesn't really matter: most people flicking through your photos on their smartphones won't notice—or care. Social media means never having to say you're sorry you forgot your DSLR and only had your iPhone! Professionals can achieve amazing results with smartphones—but so can amateurs, with a bit of extra help. One of the drawbacks of smartphone cameras is the lack of manual control (generally even less than with a basic compact digital camera). You can get around that, to a certain extent, by using add-on apps that give you much more control over fiddly, old-school settings like ISO, aperture, shutter speed, and white balance. (Search your favorite app store for keywords like "professional photography" or "manual photography".) You can also add snap-on lenses to smartphones to get around the drawbacks of a fixed-focal-length lens (though there's nothing you can do about the tiny, poorer-quality image sensor). Once your photos are safely snapped, there are plenty of photo-editing apps for smartphones as well, including a slimmed-down, free version of PhotoShop, which can help you retouch your amateur "sow's ears" into professional "silk purses." So why still buy digital? Since many people now own a smartphone, the real question is whether you need a digital camera as well. It's very hard to see an argument for point-and-shoot compacts anymore: for social-media snaps, most of us can get by with our phones. For this website, I take a lot of macro photos—close-ups of circuits and mechanical parts—with my Ixus that I couldn't possibly capture with the LG, so I won't be jumping ship anytime soon. If you want to take professional quality photos, there's really no comparison between smartphones and DSLRs. A top-notch DSLR has a better-quality image sensor (up to 50 times bigger in area than the one in a smartphone) and a much better lens: these two fundamentally important things make the "raw" image from a DSLR far better. Add in all those fiddly manual controls you have on a DSLR and you'll be able to capture a far greater range of photos across a far wider range of lighting conditions. If you really care about the quality of your photos, instant-uploading to sharing sites might be a less important consideration: you'll want to view your photos on a big monitor, retouch them, and only share them when you're happy. Having said that, you can now buy hybrid digital cameras with built-in Wi-Fi that offer similar instant-sharing convenience to smartphones. And, of course, there's nothing to stop you carrying a smartphone and a DSLR if you really want the best of both worlds! Artwork: The original digital camera, invented in the 1970s by Steven Sasson, worked a bit like an old-style camcorder and needed a separate playback monitor. First (top), you took your photos with the camera (blue), which used a CCD to record them onto a magnetic tape (red). Later (bottom), when you got back home, you took out the tape, inserted it into a computer (orange), and viewed the pictures you'd taken on a computer monitor or TV (green). 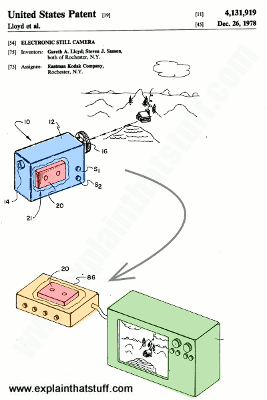 Artwork from US Patent 4,131,919: Electronic still camera by Gareth A. Lloyd, Steven J. Sasson courtesy of US Patent & Trademark Office. 4th century BCE: Chinese invented the camera obscura (a darkened room with a hole in the drapes that projects an image of the outside world onto a distant wall). 1827: French Joseph Nicéphore Niépce (1765–1833) made the world's first photographs. His method was no good for taking portraits of people because the camera shutter had to be left open for eight hours. 1839: French opera-house scene painter Louis Daguerre (1787–1851) announced the invention of photos on silver plates that became known as daguerreotypes. 1839: William Henry Fox Talbot (1800–1877) invented the photographic negative process. 1851: British artist and photographer Frederick Scott Archer (1813–1857) invented a way of taking pin-sharp photos onto wet glass plates. 1870s: British physician Dr Richard Maddox (1816–1902) developed a way of taking photos using dry plates and gelatin. 1883: American inventor George Eastman (1854–1932) invented the modern photographic film. 1888: George Eastman launched his easy-to-use Kodak camera. His slogan was: "You push the button and we do the rest." 1947: Edwin Land (1909–1991) invented the instant polaroid camera. 1963: Edwin Land invented the color polaroid camera. 1975: US electrical engineer Steven Sasson invented the first CCD-based electronic camera with Gareth Lloyd at Eastman Kodak. 1990s: Digital cameras started to become popular, gradually making film cameras obsolete. 2000s: Advanced cellphones with built-in digital cameras began to make standalone digital cameras redundant for everyday snapshot photography. The Smart Phone Photography Guide: Shoot, Edit, Experiment, Share by Peter Cope. Carlton, 2018. From selfies to VR, this book has lots of tips for getting the most from your smartphone camera. Digital Photography For Dummies by Julie King. John Wiley, 2016. An illustrated, basic introduction. Digital Photography: An Introduction by Tom Ang. Dorling Kindersley, 2013. A good, basic introduction to digital techniques, but experienced photographers may find it too simplistic. Presented in the very visual DK style. The Digital Photography Book by Scott Kelby. Peachpit Press, 2006–2014. A series of five more detailed books exploring different aspects of practical photography. Mirrorless cameras: Photography's new decisive moment by Leo Kelion. BBC News, 26 September 2018. How bigger sensors and mirrorless cameras are rekindling interest in digital cameras. Smartphone Photography Evolves With Camera Apps and Related Tools by Kit Eaton. The New York Times, 1 October 2014. New camera apps are helping smartphones to simulate the kind of advanced controls previously found only on sophisticated digital SLRs. In Say, Can You Make Phone Calls on That Camera? (The New York Times, 16 November 2011), Nick Bilton looks at snap-on lenses and other attachments for extending the range of pictures you can take with your phone. The death of photography: are camera phones destroying an artform? by Stuart Jeffries. The Guardian, 13 December 2013. Is the sheer quantity of photos we're now taking spoiling their quality—and the quality of the moments we're recording? US Patent 4,131,919: Electronic still camera by Gareth A. Lloyd, Steven J. Sasson, Eastman Kodak Company, December 26, 1978. The very first CCD-based digital camera, patented by Kodak back in the 1970s.